So our lovely OT Anele would like Oz to practice his pen control. (Use of ‘tools’ is especially hard if you have sensory processing issues). I’m sharing this as I had to wrack my brain for ideas and if this can help someone else in the same boat then so be it! Now perfectionism and practising don’t easily go hand in hand so we’ve had to employ a few tricks. 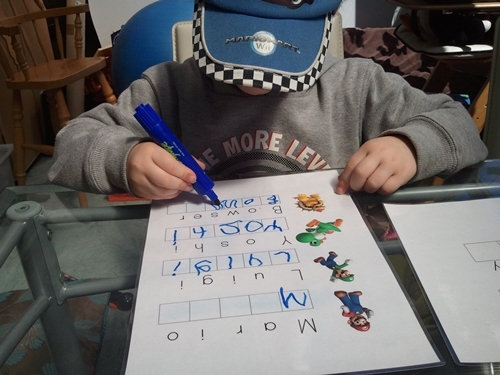 It took a while but he finally agreed that colouring is okay (of course we had to download mario to colour). I had already downloaded fonts called print clearly and print dotted that show non cursive letters either solid or dotted and he’s happy to write over the dots. Letting go and doing it alone however, totally unacceptable in Oz-land. 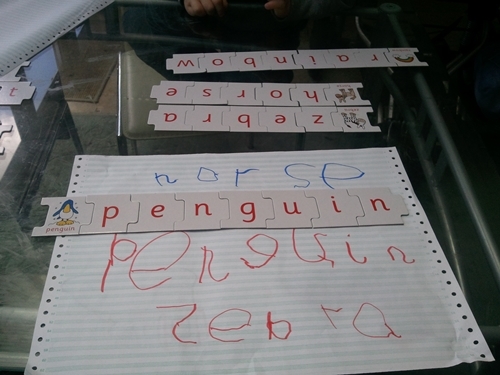 Whilst doing letter puzzles I started a copying game, which was well received. 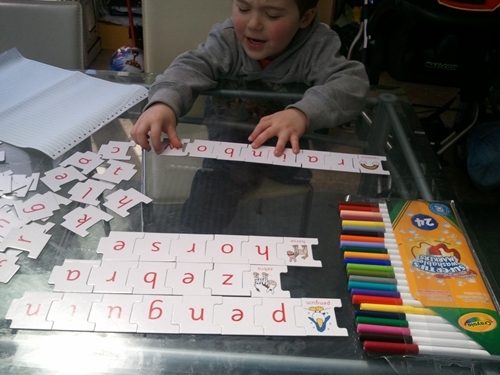 of course this led to him obsessing about the size and lining up of his letters. Lines are aparently no help (how could you think that would help, Mummy? was the basic response!) So I’ve done some sheets with boxes to write letters in. Fortunately I had the forethought to laminate them or we’d be out of ink! This lot are Mario but I have in mind some Formula 1 themed sheets to balance out the obsessions. No, this isn’t the same day, it’s just that the mario hoodie is permenently attached! I’m not sure if the copyright laws let me post the sheets, but if it would help your little mario fan I’m happy to send them to you! Nice pen holding Oz, wish my girls held their pens as well as you!! !